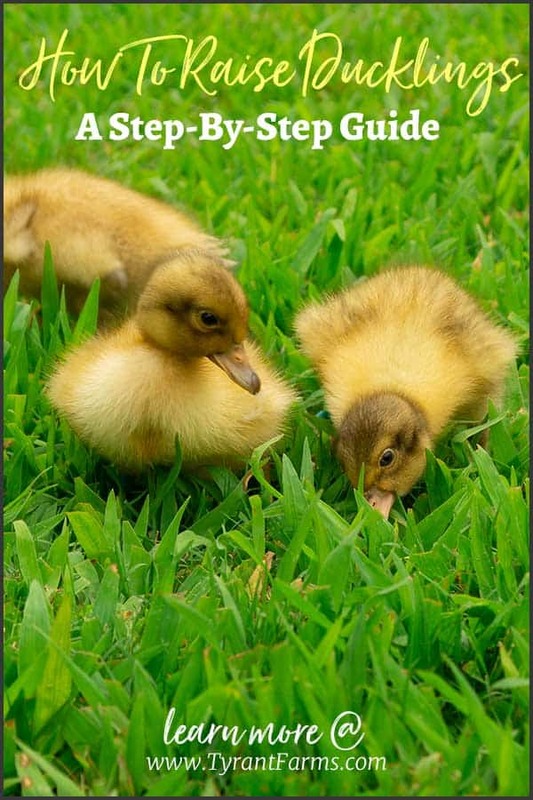 Our step-by-step How to Raise Ducklings Guide is intended to provide you with all the information you need to know to raise happy, healthy ducklings from hatch day to adulthood. This article is directed towards backyard duck owners and homesteaders with small flocks, not farmers who raise ducklings by the hundreds or thousands. Also, please note that if you plan to get Easter ducklings as a gift for children who will soon lose interest in the ducks or not take adequate care of them, please do NOT get ducklings (as we’ve written about here). Raising ducklings is a lot of responsibility. 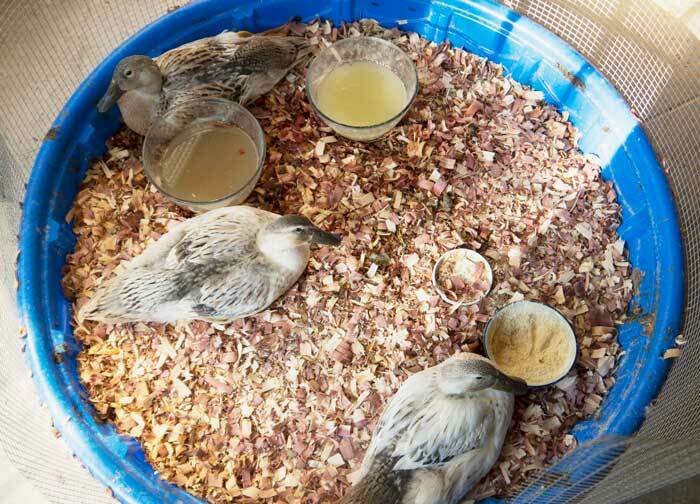 Failure to properly plan for and care for ducklings will end up in sick, dead, or abandoned ducks. If you plan to be responsible duck parents, thank you and please read on! Warning: There will be many duckling photos throughout this article. If you’re allergic to cuteness, please stop reading and consult your physician. 1. Should you incubate eggs or get hatched ducklings? 2. What time of year should you get ducklings? 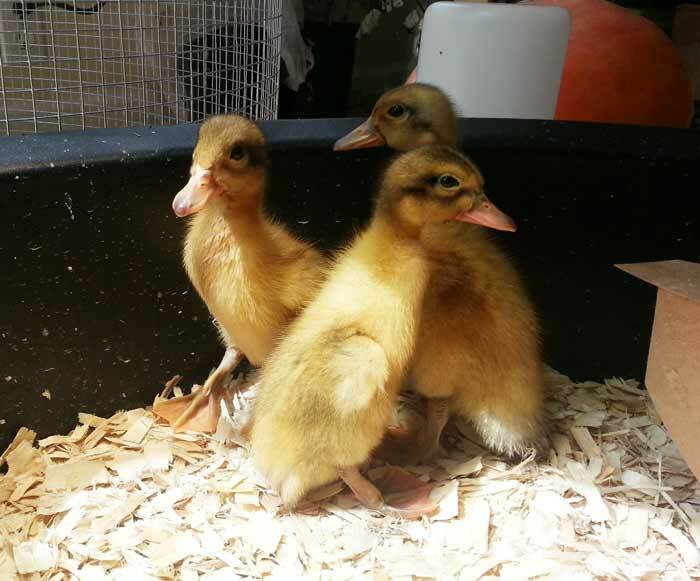 If it’s your first time raising ducklings, we highly recommend you get hatched ducklings. Properly incubating duck eggs requires a lot of extra work, knowledge, and equipment. Also, duck eggs have slightly different requirements than chickens (such as higher moisture levels), so the process is more specialized. Where do you get ducklings? a well-known national breeder such as Metzer Farms or Holderreads Waterfowl Farm & Preservation Center. The advantages of going with Metzer or Holderreads are that you can get the exact breed(s) you want. Both ship ducklings immediately after hatching and your ducklings will arrive at your local post office for pickup within 24-48 hours, depending on where you live. The great duckling un-packaging! This was our first shipment of ducklings from Metzer Farms. Metzer includes grow gel, a specialized food/liquid that provides the ducklings with all the nutrition and water they need for the journey. Holderreads has an exceptional breeding program, but they require you to get a “straight run” of unsexed ducklings. That means you’ll end up with an unknown mix of male and female ducks. Metzer allows you to get sexed ducks to your specifications. And they’re out! The ducklings moments after coming out of their box from Metzer. It took them about 2.5 seconds to begin making an absolute mess, a talent which ducklings are masterful at. Getting sexed ducklings is especially important if you’re planning to raise ducklings / ducks as either pets or egg producers (not for meat). Why? Having multiple males in your backyard flock will cause your adult males to fight endlessly if there are females around to compete over. Separate pens would be required once they reach mating age. Also, a female:male ratio lower than 3:1 will lead to over-mated female ducks and a higher likelihood of injury. On the other hand, if you’re raising ducks purely for pets or meat production, you can get all males. Thus, for first time duck parents we’d recommend getting a sexed run from Metzer Farms. Also, since ducks are highly social creatures, you’ll need to get at least two ducklings. 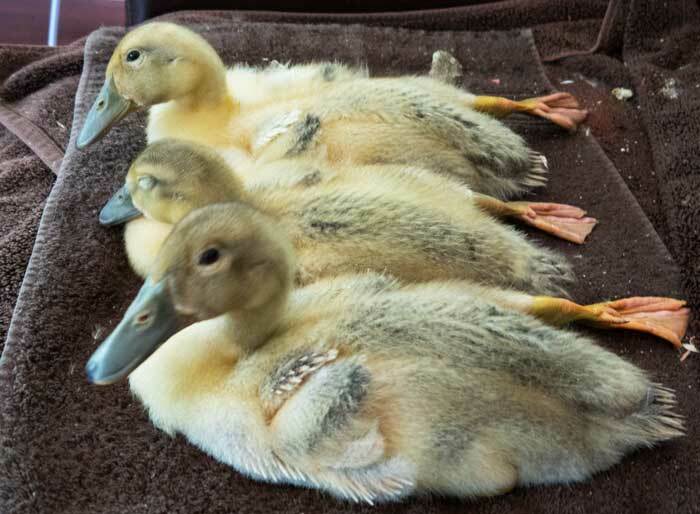 We’d recommend getting three just in case something happens to one duckling – that way, you don’t end up with a single duckling who doesn’t have a 24-7 companion. One of the reasons we have such tame adult ducks is that we interacted so frequently with our ducklings, including countless hours of duckling cuddles. Read this article for more tips about how to get your ducks to like you. In the wild, ducks lay eggs in the warm months of spring and summer. This is because young ducklings require lots of warmth and food. Depending on where you live, we recommend you only get ducklings between the months of April – July. Ducklings should only be raised by humans during the warm months, mimicking what happens in nature. Even though you’ll be raising your ducklings in a climate-controlled environment, you’ll still want to take them for outdoor excursions to acclimate them to their environment, keep them happy, and inoculate their developing biomes and immune systems with beneficial microbes. It’s much easier to accomplish these aims when it’s warm outside than when it’s cold. To raise ducklings responsibly, you should prepare for them weeks/months BEFORE you get them, NOT after you’ve brought them back to your home. 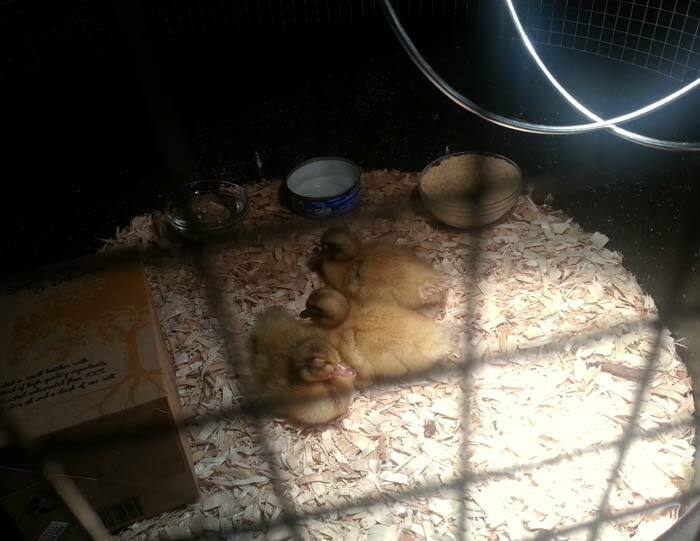 Our ducklings sleeping peaceful their first night at Tyrant Farms. We initially had an empty cracker box in their brooder in case they wanted to hide away or explore. Humorously, this inspired the name of their outdoor coop: The Quacker Box. A duckling brooder will be the home where your ducklings are raised for the first 6-8 weeks of their lives. 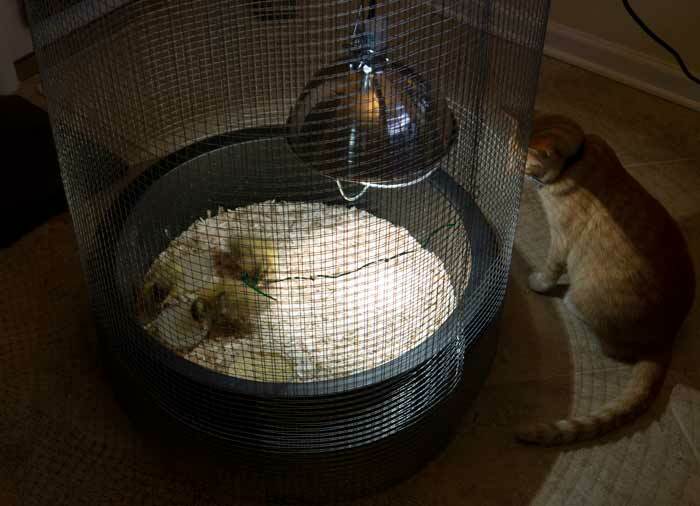 Given the care requirements, you’ll likely want to set up your duckling brooder indoors on a tile or vinyl floor (easier for cleaning). There is no single way to make a duckling brooder, and materials will vary depending on how many ducklings you get. We’ve raised ducklings multiple times and our preferred brooder is a baby pool with 1/2″ wire mesh caging wrapped around it 4′ high. This is easy to clean, keeps the ducklings in, and keeps our cat from getting in (even though our cat now knows not to mess with ducklings or ducks). Bob the cat’s first viewing of our ducklings. Today, our cat and ducks will sleep on the couch together. Our ducks will even beat Bob up if he irritates them, without him lifting a finger to defend himself. Do note that if you have dogs or cats, you need to take every precaution necessary to make sure they can’t get to your ducklings. a room that lets in as much natural sunlight as possible. Ducklings don’t have feathers and aren’t able to keep themselves warm. Being too cold is perhaps the most common cause of death or illness in young ducklings, so you’ll want to pay especially careful attention to your ducklings’ temperature setup and needs. Raise your right flipper if you love cute ducklings! In all seriousness, ducks are hilarious animals with peculiar habits. For instance, our ducklings (and adult ducks) love to stretch and kick a flipper back when they’re relaxing. Brinsea EcoGlow brooder heater. Four big advantages with the EcoGlow are that it’s not a fire hazard, it can’t tip over, it’s adjustable to three different height positions, and it’s very energy efficient. You’ll also want to have a thermometer that you can safely mount on the side of your brooder to monitor temperatures. placed in one corner of the brooder so the ducklings can come underneath it when they’re cold and go elsewhere in their brooder if they get hot. What temperature should your brooder lamp be? Once you hit 75°F, you can keep the brooder lamp at the same height until your ducklings are 6-8 weeks old and ready to move permanently outdoors. Your ducklings will huddle together for warmth and comfort as well. 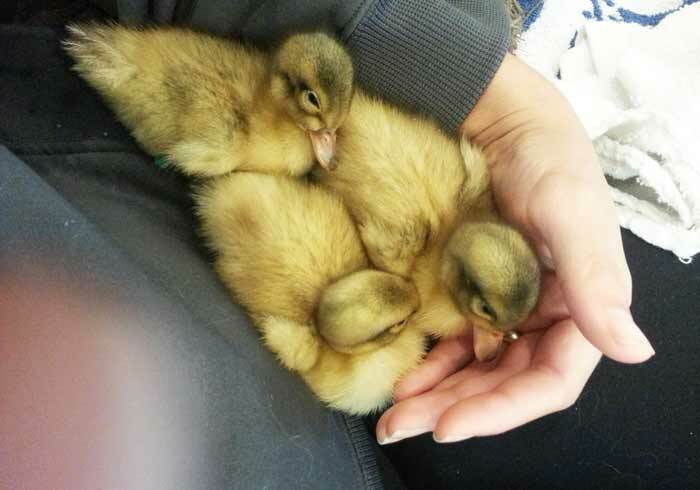 Your ducklings will love cuddling together for comfort and warmth. This is perfectly normal and doesn’t necessarily mean they’re cold or you need to adjust the temperature. Ducks are not chickens. Seems obvious enough. Nevertheless, many new duckling parents give their ducklings unmodified “chick feed” that was formulated specifically for baby chickens, which have different nutritional needs than ducklings. Option 1: Get pre-formulated non-medicated certified organic duckling starter feed. McGeary organics has a good product. If you get McGeary duckling starter feed, we still recommend you taper down the protein content at week 2 as detailed in Option 2 below. Taper protein content after two weeks. Ducklings (like chicks) require higher levels of protein the first two weeks of life, 18-20% protein to be exact. 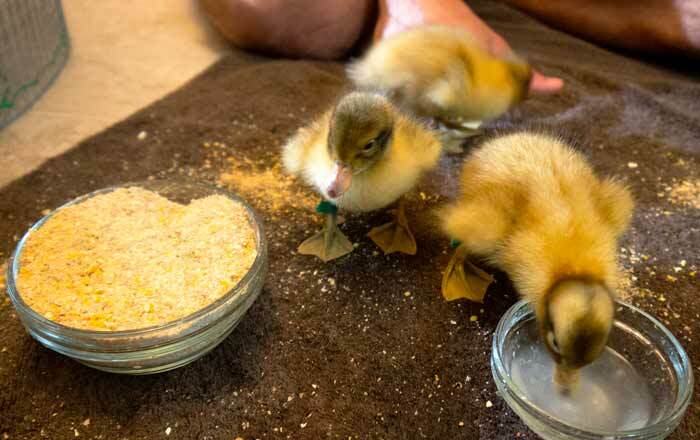 When your ducklings are 3 weeks old, bump the protein levels of your chick feed down to 15-16% by mixing in 20% organic old fashioned oats to their crumble. This encourages your ducklings to grow at a healthy, normal rate vs. the more accelerated rate commonly recommended for broilers & commercial egg layers (as per duck expert, Dave Holderread, in Storay’s Guide To Raising Ducks). This is extremely important because sustained higher levels of protein can cause leg and wing deformities in addition to causing kidney and liver damage. Add Niacin (Vitamin B3). Because ducklings grow faster than chicks, chick starter does not have the niacin levels that are optimal for ducklings. NRC requirements for ducklings = 55 mg/kg niacin per 2.2 pounds of feed compared to only 27-35 mg/kg for chicks. Niacin deficiencies in ducklings lead to leg deformities since they don’t have the nutrition to support proper bone and muscle development. To supplement, we typically add 2 tablespoons of brewers yeast per cup of crumble or 100mg B-Complex. (You can also add the same amount per gallon of drinking water instead of to their food.) You can order either form of Niacin via Amazon: Brewer’s Yeast or as B-Complex vitamin capsules (make sure they’re not timed release or flush-free – neither of those are Niacin). Add water. 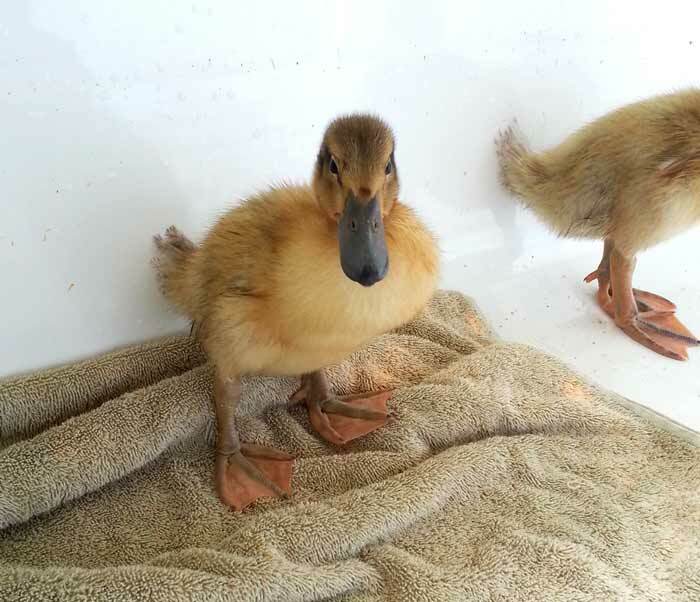 What happens if you put dry niacin/Brewer’s yeast in your duckling’s dry starter feed? All the niacin goes to the bottom of the bowl. 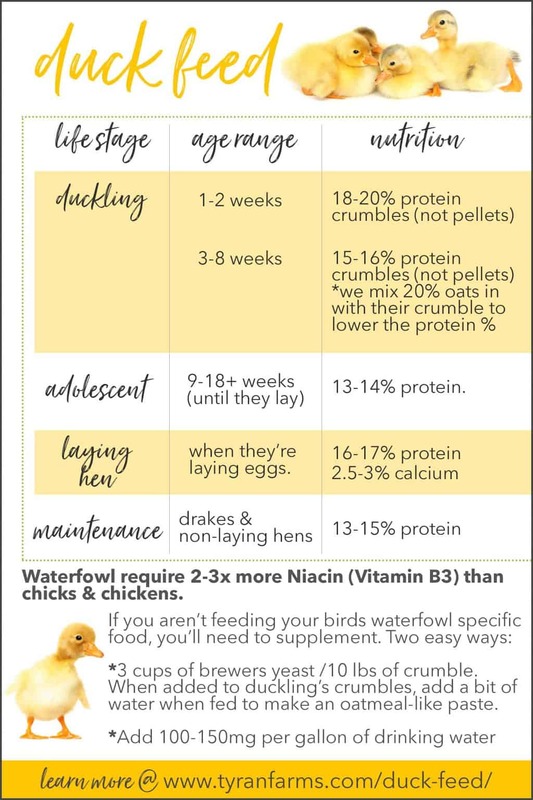 To make sure your ducklings are eating good ratios of niacin with each bite of food, stir in just enough water to make the food + niacin stick together. It should be the consistency of oatmeal. Duckling feed bowl – Duckling (and ducks) are hilariously messy creatures. We recommend putting your ducklings’ feed in metal or ceramic bowls that are difficult to tip but very easy to clean. Clean their bowls once per day with hot soapy water. small stainless steel coop bowls that attach to the side of the brooder. If you use larger jug-style feeders that utilize gravity to refill their food, the stored feed will likely get wet, moldy and contaminated as the moisture wicks up via capillary action. You risk losing your food, but more importantly you risk causing your ducklings to get a chronic infection from eating contaminated food. We very nearly lost Marigold (she prefers to be called “Mawy”), one of our ducklings, due to drowning in a water dish. If I hadn’t heard her loud panic peeps and woken up at 2am to drag her out of her water bowl, hand dry her, and warm her up under my shirt for 45 minutes, she probably wouldn’t be here. The reason we’d made the mistake of having a larger water bowl in her brooder is because we were allowing Jackson, one of our adult ducks, to raise the ducklings and wanted to make sure Jackson could easily drink. 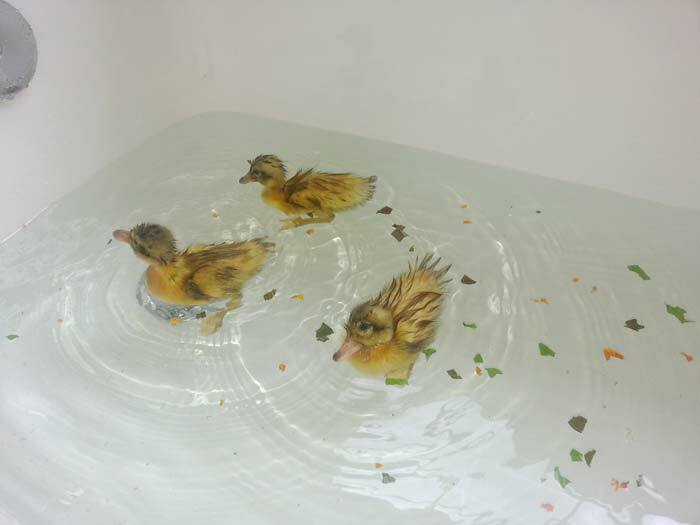 The moral of the Marigold story: to safely raise ducklings, use hard-to-tip, but shallow water bowls that your ducklings can easily get out of if/when they happen to get into them. Have two water bowls, not just one. This is backup in case they spill, drink, or muck up one bowl of water. If they continue to eat food without having water present, they could choke to death. Don’t put your water and food bowls right next to each other or your ducklings will quickly turn both bowls into a disgusting muck pit. As mentioned above in the food section, you can also add niacin to your ducklings’ water bowl. 2 tablespoons of brewers yeast or 100mg B-Complex per 1 gallon of drinking water. Like adult ducks, ducklings also require grit in order to grind food in their crops. In the wild, ducklings get grit by foraging on a lake shore or sand bar. Providing a bowl of soil from your yard in their brooder. Hopefully, it goes without saying that no synthetic pesticides should be used in your yard when you’re raising ducklings – or any other time for that matter. In the wild, ducklings eat quite a bit of duckweed and other wild greens that grow in and around the water. One of the reasons we garden is to grow a diversity of the most nutrient-dense plant foods possible – both for us and our ducks. We always make sure there are fresh, finely chopped garden greens in our duckling water bowls, which they eat with great gusto. use plants with high concentrations of oxalic acid (spinach, beet greens, chard, sorrel) very sparingly or not at all since the oxalic acid in those plants can keep ducks from absorbing calcium. aspen flakes (which are less dusty than pine). Don’t use cedar, since it contains volatile oils that can cause both you and your ducklings respiratory problems or allergic reactions. Did we mention that ducklings are hilariously messy creatures? You will be shocked at the mess that such small and adorable creatures can make in a relatively short period of time. Several times per day once their brooder bedding is caked in water, food, and duckling poo, you’ll want to top up the surface with a fresh layer of pine shavings or aspen. Every 2-4 days, you’ll need to plan to change out the entire floor of pine shavings and start from scratch (which will make your compost pile happy). As previously mentioned, you’ll want to completely clean their water and food bowls daily as well. Again, to raise ducklings that don’t get sick, it’s very important that your ducklings have a dry, clean brooder and sanitary conditions so they can stay warm, happy, and illness-free. Below is a full list of recommended supplies you should have ready BEFORE you actually raise ducklings. Each item/supply and the rationale behind it was detailed in the sections above. Ducklings swimming for the first time = pure cuteness. Like adult ducks, ducklings LOVE to swim. After all, their bodies are amazing hybrid machines adapted for swimming and flying – it’s what ducks do. In the wild, ducklings start swimming on day 1, and yours can too. Swimming your ducklings helps with proper muscle development, and makes them (and you) exceedingly happy. You’ll get a good laugh the first time you see your ducklings splashing and diving. They get cold very easily. This can quickly lead to hypothermia, illness, and death. They don’t produce their own oil yet, so they’re not waterproof. 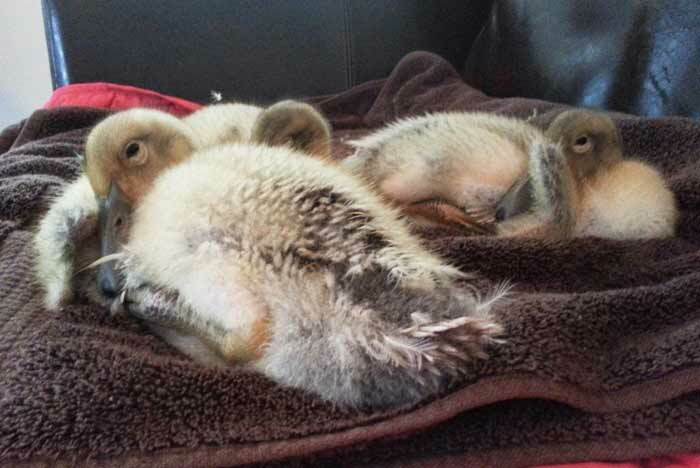 In the wild, ducklings cover themselves with momma duck’s oil when they cuddle underneath and against her. They might not be able to get out of the swimming hole on their own when they need to. 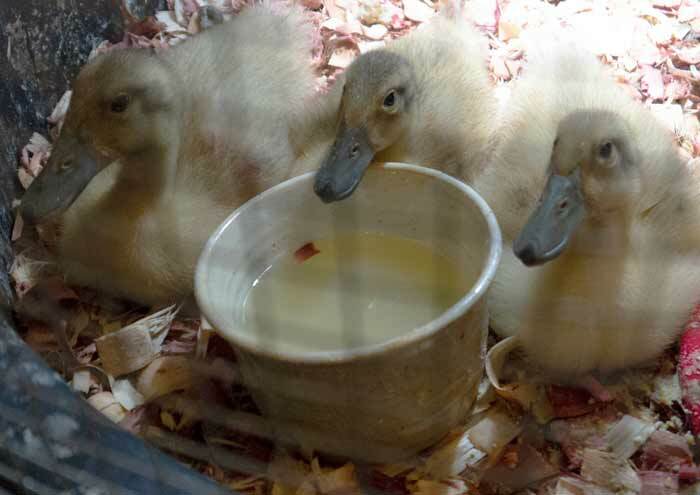 Don’t put large or deep water bowls in your duckling brooder. Instead, the water dishes should be no deeper than a couple of inches and easy for them to get out of. Don’t put a swimming pool or swimming bowl in their brooder. Swim them for about 5 minutes or less (less if they look like they’re done or getting bored) during the first two weeks, and stay with them the whole time. During the first week, a large kitchen bowl will do. By week 4+ an outdoor kiddy pool or indoor bathtub will be needed, and you can also start letting them have more swimming autonomy, deciding when they’re done and when to get out of the water. Use mild water, not cold or hot water in their swimming container. As soon as you take them out of the water, make sure they have a warm, dry place to dry themselves and preen. (Preening is the grooming ducks do after a swim.) Putting them back in their brooder with access to their heat lamp will do. Duckling post-swim and post-drying. Next up: nap time! Another beneficial activity for both you and your ducklings is taking them outdoors for adventures. You’ll be proud duckling parents when you see your ducklings becoming increasingly independent, bravely foraging and hunting insects, nibbling plants, etc. Stay with them the entire time for the first 4 weeks. A young duckling is a tempting snack for neighborhood cats, snakes, and other predators. After 4 weeks, you might consider constructing a 1/2″ mesh wire enclosure/run to allow them to play outdoors on their own in a protected environment. Even then, make sure you’re within ear distance in the event they sound the alarm. Ideally, outdoor temps are no more than 10 degrees cooler than their brooder temps – the younger they are, the more important this is to ensure that they don’t get too cold. If it’s cold or rainy, skip outdoor adventures unless your ducklings are 4+ weeks old. Don’t put your ducklings anywhere near spots where pesticides have been used. Remove anything that could injure them if eaten: scraps of aluminum foil, plastic, screws, pieces of ribbon, etc. The risk of duckling injury or death continues to decline the older they get. Your goal is to slowly and safely get them acclimated to the outdoor environment that will eventually be their permanent home. 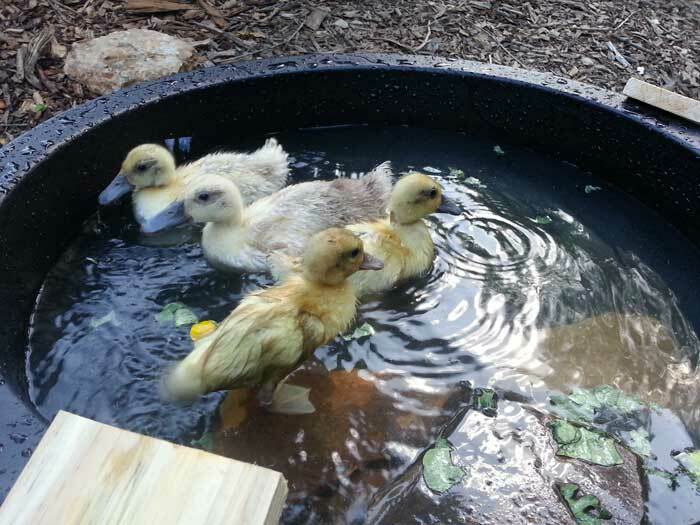 The ducklings first “wild swim” in the outdoor kiddy pool. Notice the rocks are situated so they can easily go into the shallow end of the pool to rest or hop out if they want to. Ducklings grow incredibly quickly, far faster than chicken chicks. Each time we raise ducklings (we have Welsh Harlequins), we regularly weigh them and find that they more than double in weight each week. In fact, we observe noticeable differences in size between the time we put them to bed at night and see them in the morning! 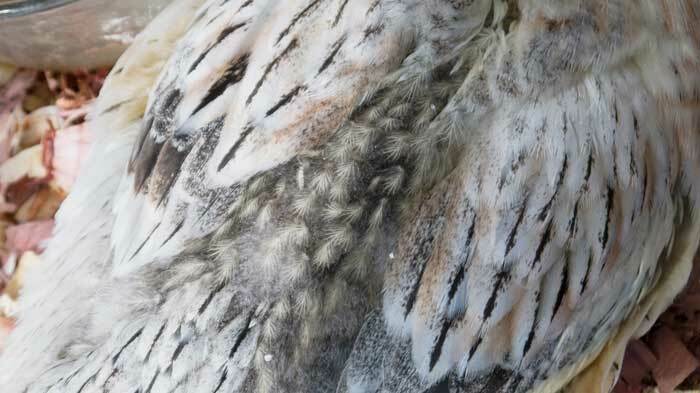 Weeks 11-12 – molt juvenile feathers and start to grow adult feathers. On our girls, the last feathers to come in are the top of their backs between their wings. Here you can see one of our girls almost finished developing her juvenile feathers. Once your ducklings have their juvenile feathers and “look like ducks” (weeks 6-8), it’s time to move them outdoors into their permanent home. This process is much more emotionally traumatizing to their parents (you) than it is the ducklings. Our “ducklings” at around 7 weeks old in their juvenile plumage. They’re now of age to be outdoor flock members. This should be a graduated process, not a sudden transition. 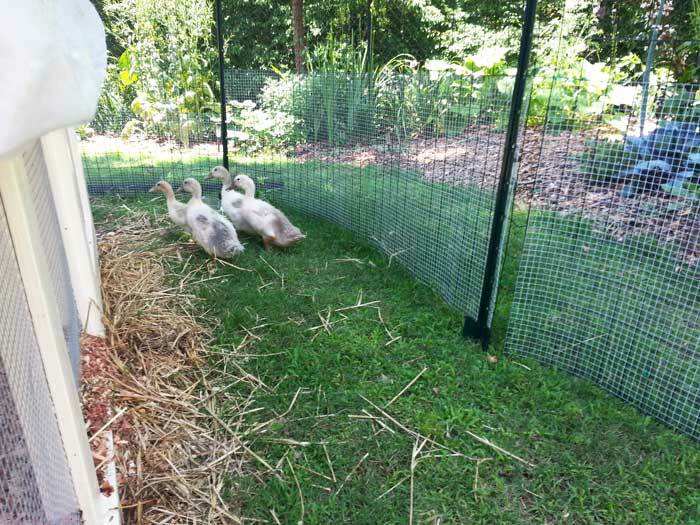 Each day leading up to move out day, your ducklings should be provided with more time outdoors (with safety precautions taken to keep them safe from predators), thus helping them gain a sense of autonomy and ownership over their new outdoor surroundings. Our ducklings spent a lot of time with us and alone exploring their new outdoor home before they moved outdoors. As you can see here, they had a coop plus a protected run to explore during the transition process. Nevertheless, the first nights that your ducklings are outdoors in their coop on their own will likely be a stressful experience for you. (Much less so for your ducklings, who will likely just huddle together and sleep peacefully.) To help yourself through the transition, we’d recommend building or placing your duck coop so that you can easily see if from a window in your home. Your ducks’ outdoor coops, runs, and/or living areas should have been carefully planned, designed, and built weeks or months in advance to ensure their safety. When preparing your ducks’ final outdoor living area, please read our article 17 tips to keep your ducks safe from predators. It’s hard to imagine how painful it would be to go through the process of raising ducklings, only to see them injured or killed by a predator after their outdoor transition. Please plan ahead so this doesn’t happen to you or your flock! Once you’ve gotten to this point in your ducklings’s development, congratulate yourself! 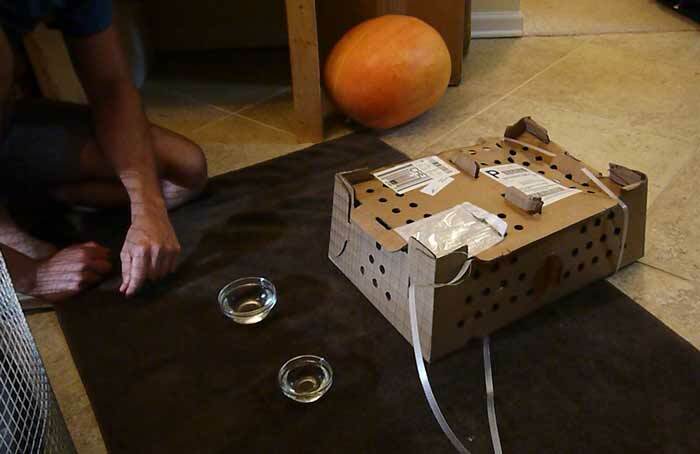 You’ve successfully raised ducklings, which is not an easy task! We’ve now raised and integrated three flocks of ducklings/ducks. If you’re introducing new ducklings to an existing flock, there are a few precautions you should take to ensure a peaceful transition that doesn’t result in fighting or injury. During your outdoor adventures (see #4 above) with your ducklings, make sure to have as many of those adventures as possible around your existing flock. Just keep your ducklings (and you) inside a piece of fencing that keeps your adult ducks out. Don’t let them begin to physically commingle (with human supervision) until they’ve had weeks to acclimate and your ducklings are much larger. Our adult ducks are typically just curious, not aggressive, towards new young ducklings, but they could easily hurt them, so we don’t take risks. With regular visits over the course of the 6-8 weeks before you put your ducklings outside, the two flocks will have plenty of time to acclimate and integrate. You’ll know when it’s time for them to be allowed to be together unsupervised. Also, don’t be concerned about the occasional nip between your ducklings or a nip between your older ducks and your new duckling flock members. This is simply ducks establishing their boundaries and flock dynamics. Male ducks (drakes) are far more aggressive and territorial than female ducks. Integrating female ducklings into a flock with a male is much trickier than integrating two groups of females. Susan the Tyrant giving Sir Winston Duckbill a lecture about his poor decision making. In fact, our five year old drake, Sir Winston Duckbill, still can’t be trusted to behave himself around our girls, much less new ducklings. That’s why he has his own house and run, and is only allowed brief “conjugal visits” with his flock in the morning and at night. Our girls are much happier and cohesive with Winston separated. Sir Winston Duckbill has his own run inside of our fenced backyard. He still spends his day with the flock, but he’s separated by fencing in order to improve flock social dynamics and prevent him from mating disinterested females. Integrating mixed male-female flocks together would be even more challenging. Upon reaching sexual maturity, our original male ducks spent their days trying to attack and kill each other for rights to the females. Today, we have 5 females and 1 male. minimum of 3 females to 1 male, with no more than 1 male per flock. Can you raise ducklings and chicks together? Yes, you can raise chicks and ducklings together! In fact, they make fast friends. Be prepared for your ducklings to quickly outgrow your chicks though. If you’re trying to integrate ducklings or chicks into an existing poultry flock, we still recommend you follow the advice above about slow, cautious, safe integration. Do you have more questions about how to raise ducklings? Ask away in the comments below! If you like this article about How to Raise Ducklings, please pin it!